Is Downtown Sacramento getting a new burger restaurant? Five Guys, an American, fast-casual restaurant chain, lists a new location at 701 L Street as "coming soon." The website does not have an opening date listed. There are currently no jobs listed for the downtown Sacramento location. 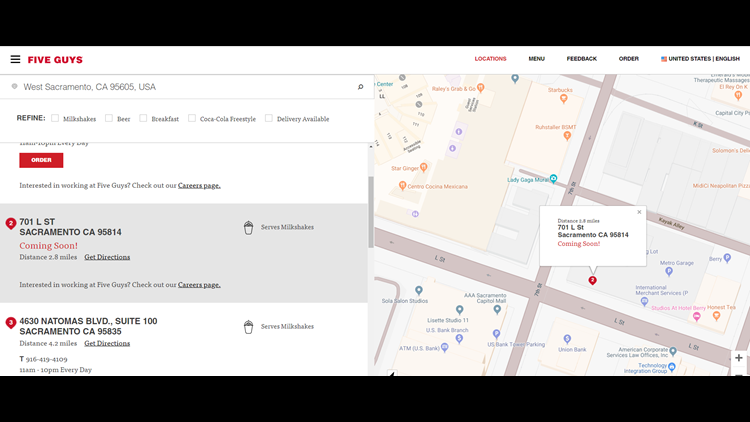 The Five Guys website lists a downtown Sacramento location as "coming soon." Five Guys already has two location in Sacramento — 2912 Pasatiempo Lane and 4630 Natomas Blvd. They're known for their burgers, fries and generous serving size. In 2017, Five Guys was voted as the burger restaurant brand of the year, topping California favorite In & Out.